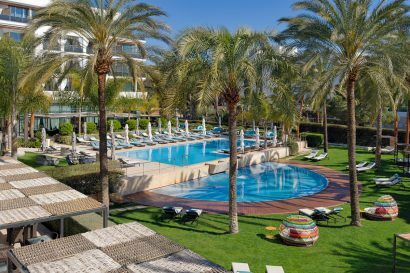 Set in an idyllic location, the Aguas de Ibiza Grand Luxe Hotel offers 112 guestrooms with impeccable views over Santa Eulalia bay. It combines contemporary style with natural elements, to make an unforgettable experience out of your stay following the Feng Shui philosophy principles and with lots of attention to detail. The hotel is based on attention to four principal values which are blended to create a unique experience: Health, Nature, Space and Environment. Health: Thermal comfort (low-E glass to give protection from the sun andcontrol interior temperatures). Nature: Water (element on which the hotel and SPA are centred) and Earth (use of dry stone from local quarries). Space: Proportions (generous but homey), outside Views (absorption of space of panoramic views) and Scale (sensation of freedom and intimacy). Environment: Energy saving (free cooling, air conditioning with condensate and geothermal water, solar powered lighting, domotics in guestrooms, solar energy detector), optimisation of water (water saving and recycling systems), energy generation (photovoltaic panel system). Aguas de Ibiza has been recognised and honoured as the luxury boutique hotel in Ibiza with the most innovative and ambitious concept of what it means to be environmentally friendly. The project is based on a significant investment in the latest technology and photovoltaic rails, using smart building automation and systems for saving water and energy. 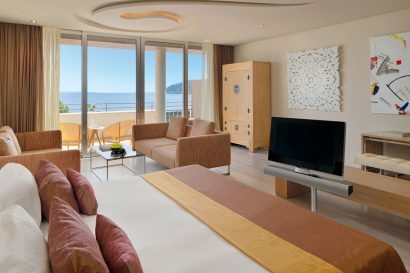 As company policy, this 5 star hotel in Santa Eulalia also advocates working with suppliers that share its philosophy. 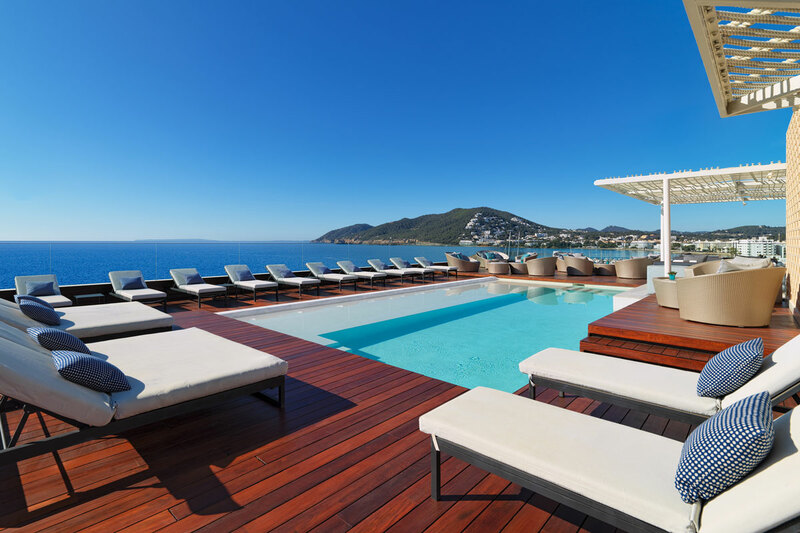 We are convinced that it is possible to offer sustainable living without sacrificing the comforts of one of the luxury boutique hotels in Ibiza. Aguas de Ibiza is located within the quiet town of Santa Eulalia on the south eastern part of the island. It takes about 20 min to get to Ibiza Town and Dalt Vila, the airport and the popular nightclubs. It’s the best spot for discovering the beaches of the north east corner of the island. 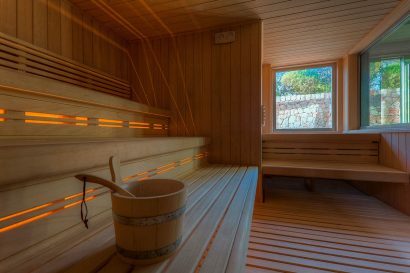 Santa Eulalia Town: 5 minute walk – Perfect for those who want to experience the real culture of Ibiza and relax in beautiful, peaceful surroundings. Santa Eulalia Marina: Walk down to the marina for some local shopping and enjoy the stunning waterside restaurants! Ibiza Old Town – Dalt Vila: 25 minute drive- With stunning examples of medieval architecture in the old Cathedral and the Castle it is easy to get lost in a different time, soak up the history and let yourself be drawn in to Ibiza’s long history. Beach Clubs: enojoy the day laid down on a sunbed with a cava sangria on the best beach clubs of the island, in less than 5 minutes driving! Children can have fun on the main pool area & Alabastro restaurant. 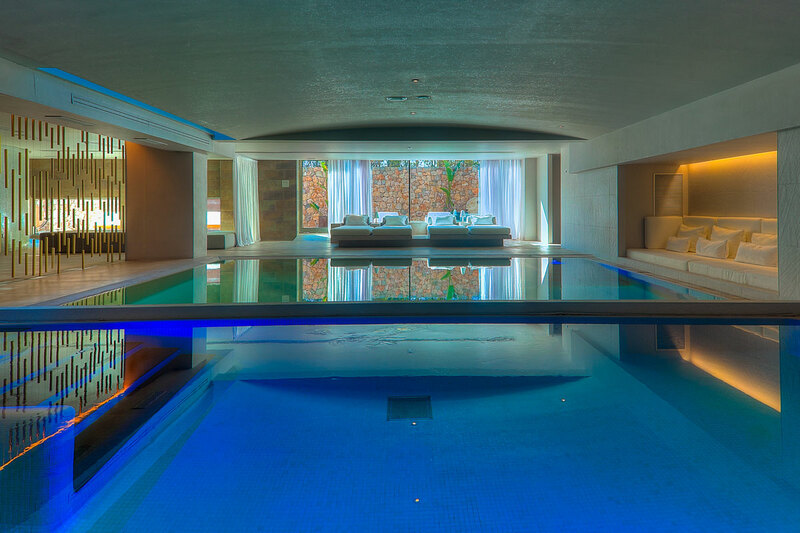 They can also enjoy the Spa access between 10am to 12pm everyday. Contemporary Mediterranean-style room with private terrace. Mountain views. Contemporary Mediterranean-style room with private terrace overlooking the pool. 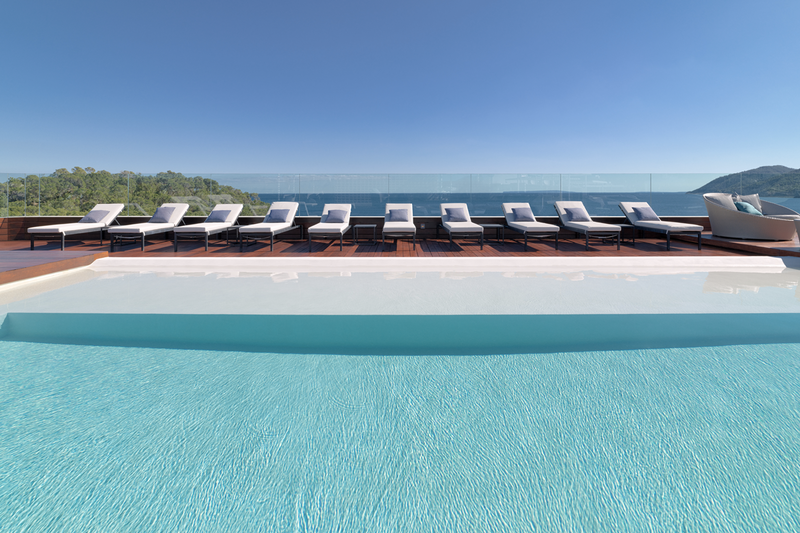 Situated opposite the sea and overlooking the island of Formentera. It can be king size bed or twin beds, all provide a living room, seperate bathtub and shower cubicle, and a private terrace. 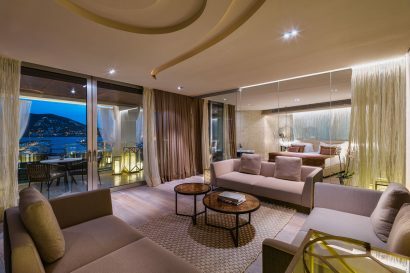 With large windows featuring views of the mountains or pool, offering guests a loft concept with a canopy bed, living room, a large bathroom with seperate bathtub and shower cubicle, also a private terrace with a solarium area. 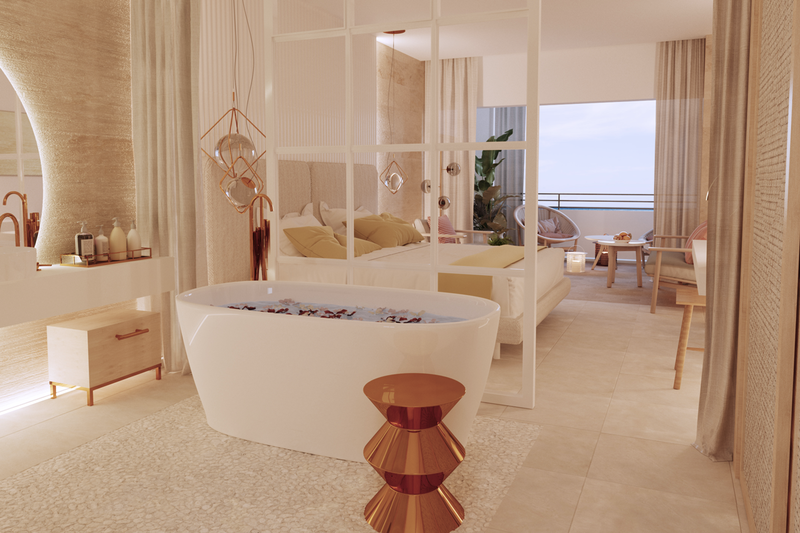 With large windows featuring panoramic views of the sea and the bay of Santa Eulalia, offering guests a loft concept with a canopy bed, living room, cloakroom and a large bathroom with double washbasin and seperate bathtub and shower cubicle. Its ample private terrace has a solarium area, dining area and circular exterior bathtub. Spacious suites featuring panoramic views of the sea and the bay of Santa Eulalia, offering guests a loft concept with a living room, a large double bed, a spacious bathroom with double washbasin and seperate bathtub and shower cubicle and a solarium area. With large windows featuring panoramic views of the sea and the bay of Santa Eulalia, featuring a living room and a large bathroom with double washbasin and seperate bathtub and shower cubicle. 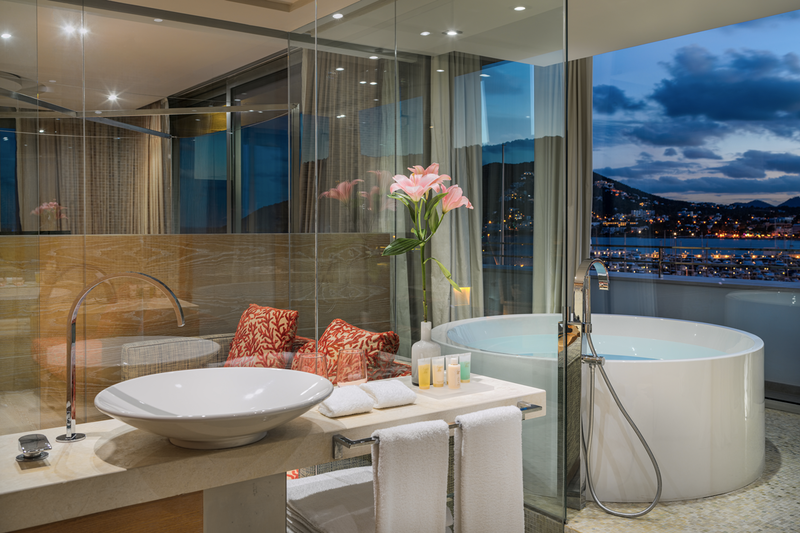 Its ample private terrace has a solarium area, dining area and circular exterior bathtub. Our best suite is a 125m2 loft with fabulous views to the island of Formentera. It has a 40m2 living room space, two independent bedrooms with their own bathrooms and a private terrace with bathtub to enjoy an unforgettable stay in Ibiza under the stars. 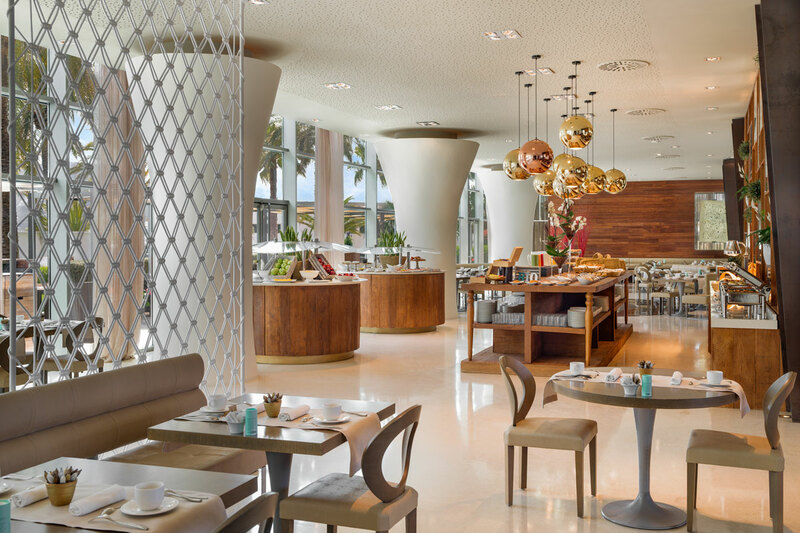 Oligo: impeccable Mediterranean style, offers a help-yourself breakfast buffet. In Oligo we can find such a large selection of sweets, fresh fruit, cold cuts, salads, small samples, smoked products, all kinds of juices and champagne. Alabastro: open all day, offers a varied menu, with healthy dishes made with ingredients from the island. 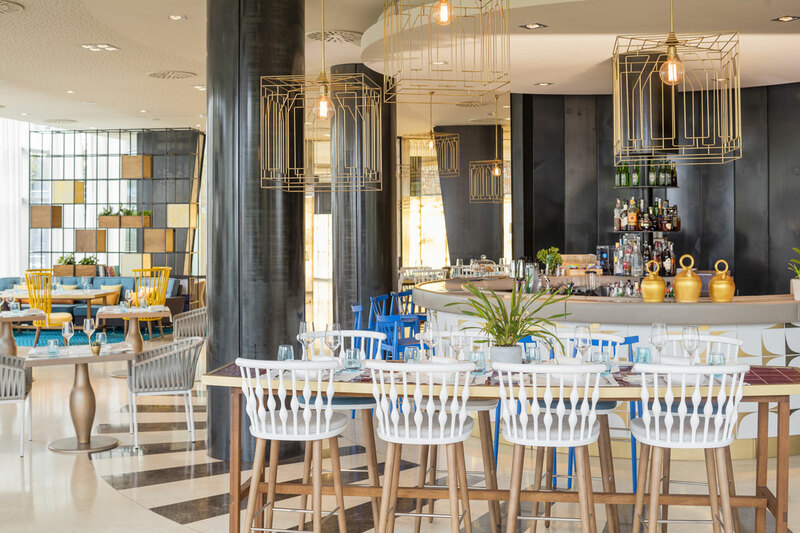 At night, it has a more elaborated menu with delicious Ibizan- Mediterranean-inspired dishes which the chef, Aitor Monteagud. Vi Cool Cocktail Bar: Located on the hotel’s rooftop and open daily until 2 am. 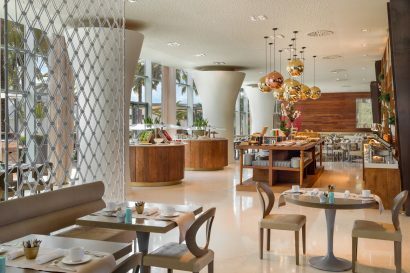 Vi Cool by Sergi Arola; Michelin Star award-winning Chef: the most informal concept of the famous Chef Sergi Arola, is made up of traditional tapas with new and fresh features originally presented in a modern way. 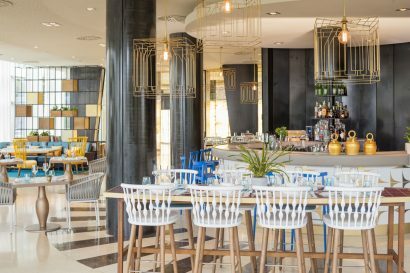 The famous ‘Bravas de Arola’ or the Fried prawns with curry and mint are some of the tasty proposals that can now be enjoyed in the new restaurant. 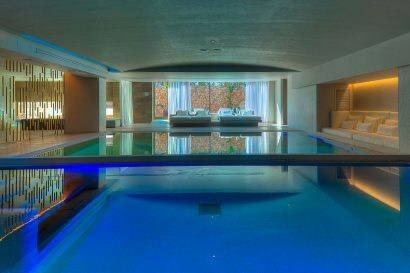 Revival Spa by Clarins. With 1,600m2 and three different clymatized pools, rooms such as hammam, sauna, and steam room. The centre also offers detox programs based on combinations of organic juices and treatments to help with weight loss. The 24hr fitness centre includes a variety of technogym aerobics, weights equipment, or plus Power Plate. Yoga classes are also offered. With three multi-use function meeting rooms for hire that can be used individually or combined, from business to weddings, and can hold up to 250 people for larger events.